Animated Snake Wreath – Because There's No Such Thing As Overdoing It When It Comes To Halloween Decorations | OhGizmo! 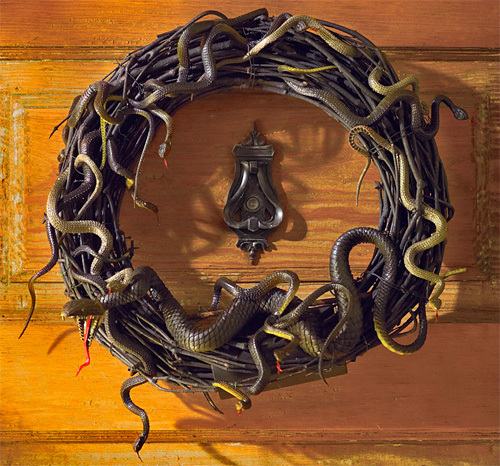 Available from Martha Stewart’s brand, the wreath is covered in rubber snakes that appear to have worked their way into every crevice. And thanks to a motion sensor, motors and a set of 4 x AA batteries, the snakes spring to life whenever anyone approaches. Well, more appropriately, the wreath starts shaking and vibrating so the rubber snakes appear to spring to life, while hissing and rattling sound effects are played. It’s $59 though, making it a great candidate for a DIY project.